We have just verified a few start times for this week. 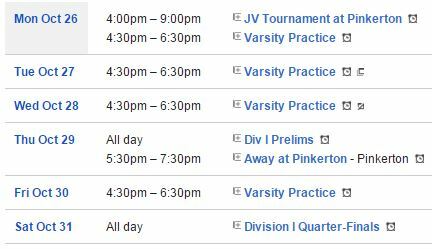 The JV will play today at Pinkerton Academy at 4 pm in the annual end of season tournament. The Schedule will be available upon arrival. Below is the schedule for the Varsity. Varsity finished the season 10-8 making us the 10th seed overall and we will travel to Pinkerton on Thursday to play the 7th seeded Astros. The Division I Tournament Bracket can be found here. Please note Pinkerton has asked to move the start time of the match to 5:30 PM. Thanks. If all goes as planned on Thursday, we will play again on Saturday Night at 6 pm (the winner of the Spaulding vs. Nashua North Match) NOTE: All JV and Freshmen players are invited and encouraged to ride the bus with us to the Pinkerton Match (and all playoff matches) and cheer on the team. Good luck to the JV tonight and Good luck to Varsity on Thursday. Congratulations to all teams on a great season.